50th Birthdays extra special with 64 plates! One motor retailer has noticed a small trend among consumers of new cars with 64 plates; the plate year relates to 50th birthdays for people born in 1964. The trend started with the 61 plate but has increased over recent years as a new car with a 'birth plate' is seen as an extra special gift for an extra special birthday. There are more than 11 million adults aged 50  64 in the UK and the year 1964 represented the tail end of the so-called baby boom, with an estimated 826,000 50 year olds celebrating their birthdays this year. Vertu Motors plc, which owns 112 dealerships across the UK, is seeing more and more people who have celebrated their 50th birthday opt for a significant purchase that happily offers the extra special plate. This year, with new car sales already at a record high, the magic of a 64 plate for a 50th birthday is an extra bonus. 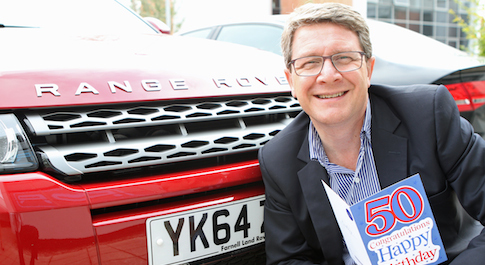 One purchaser, Graham Robb, who bought a new Range Rover from Leeds based Farnell, said: "I've worked hard and enjoyed my 50 years so a birthday present to myself that also helped British manufacturing was a great way to celebrate. The 64 year designation gives that extra special meaning to the car without the expense of seeking a private plate." Steve Ferry, Sales Director for Vertu plc, owners of Farnell, said: "A new car is always a special present, when combined with a number plate that matches your birth year it can be even more fun! This is a happy coincidence for baby boomers and car dealers alike and is an unforeseen consequence of the Government's changes to number plate rules 13 years ago."